The past year hasn't been very good for defense stocks. While the broader stock market has recovered nearly all of its losses from the 20% drop late in 2018, many of the biggest defense contractor stocks are still down by double-digits from their 2018 highs. And while "buying on the dip" is no guarantee you'll make money, there are certainly a handful of defense companies worth putting on your watchlist right now, if nothing else. Three that look particularly compelling today include Boeing (NYSE:BA), AeroVironment (NASDAQ:AVAV), and General Dynamics (NYSE:GD). 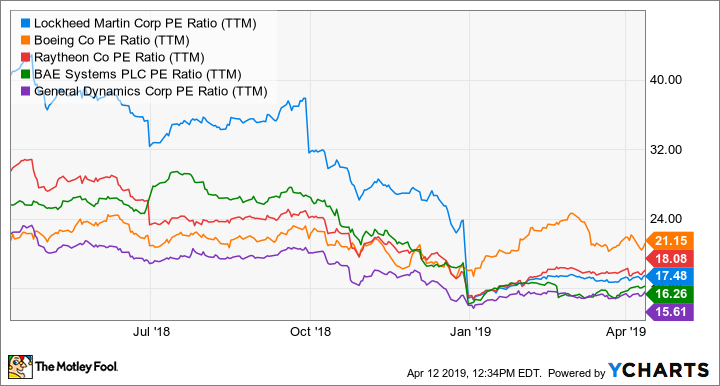 Respectively, these three stocks are down 14%, 44%, and 24% from their highs over the past year, for a litany of reasons that shouldn't be dismissed out of hand. Yet despite the risks related to ongoing problems, these are three top defense stocks, with strong long-term prospects if they can get their acts together. Keep reading for a closer look at what's happening with each company, why they are still potentially appealing, and what investors should watch for. Matt DiLallo (Boeing): Commercial aviation giant Boeing has recently run into trouble from two tragic crashes involving its 737 MAX aircraft in the past few months. The second accident led several countries to ground this aircraft, which hit the company's stock hard. It's not yet clear how much impact this will have on the company, though it could be significant, given that this aircraft is a major profit driver. However, while Boeing is best known for building airliners, the company also has a meaningful defense business that could become increasingly important to its bottom line. It recently won several defense contracts, including to supply a fleet of new patrol helicopters and make carrier-based refueling drones. It also picked up a massive $9.2-billion award to build training jets for the U.S. military. And it has a few interesting defense-related development programs under way, including autonomous submarines for the U.S. Navy and a futuristic helicopter with Lockheed Martin, that has the company positioned to win up to $100 billion in U.S. Army contracts. Boeing's defense business has the potential to be a major growth engine for the company in the coming years. While the issues with the 737 MAX are a concern and could hurt its bottom line as it works to address any problems with that aircraft, the company's long-term future looks bright, especially its defense business. That's what makes it one of the top stocks in the defense sector to put on your watch list this month. Travis Hoium (AeroVironment): One of the big trends in defense is a move to more unmanned vehicles and aircraft. Unmanned assets can reduce risk to personnel and even perform tasks more precisely than manned equipment. One company making unmanned aircraft systems a reality for the military is AeroVironment. The company makes small unmanned aircraft that can be launched by hand and used for surveillance or even as a self-detonating missile. AeroVironment has built a nice niche in the defense industry that few larger competitors will take the time or energy to attack. From a platform perspective, AeroVironment has been able to expand its aerial drone business to commercial markets. It's offering services that oil and gas companies and farmers use to assess changing landscapes efficiently. Even firefighters have used drones to assess wildfires and relay real-time information back to them. Financially, AeroVironment is starting to show its potential. Revenue has grown steadily in the past two years, and the company is now solidly profitable. 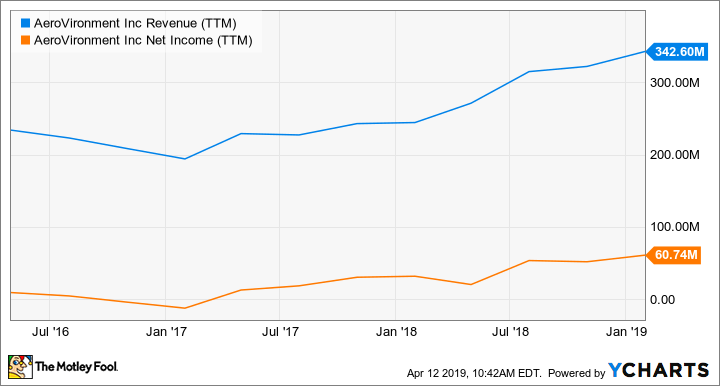 With shares trading at 27 times earnings, it's hard to argue that this is a value stock, but given the growth potential for unmanned aircraft, I still think this is a great stock to watch. Jason Hall (General Dynamics): In recent years, General Dynamics stock has consistently underperformed most of its defense giant peers, in large part because of weakness from its Gulfstream aircraft unit. Its stock price is down 19% over the past year and 23% from the peak. And as Fool.com colleague Lou Whiteman pointed out, the potential for a turnaround in its Gulfstream unit, along with its low valuation, makes General Dynamics potentially the best defense stock to buy right now. However, the tempered guidance, along with a slow recovery at Gulfstream, is prolonging the turnaround, making General Dynamics more of a "watch list" stock than an "all-in" stock right now, depending on your risk tolerance and willingness to wait out the turnaround. Whether you're ready to buy some and wait for the story to play out or you prefer to keep an eye on the story for now, General Dynamics tops my list of defense stocks to watch today.